There are so many ways to approach a book review for a book like this. Often it comes down to what resonates based on my own life experience. That's where we'll start. People often ask me why I have dogs and not human children. The answer is complicated, but planet overpopulation is one of many factors in my decision not to bring more people into the world. Feldstein talks about that in the book, including how lack of sexual and reproductive freedoms around the world put animals (including us) in danger. I knew from the age of 13 that I probably would not have kids, so that's an old (and very personal) decision, so I'm not sure it counts toward me changing the world right now. 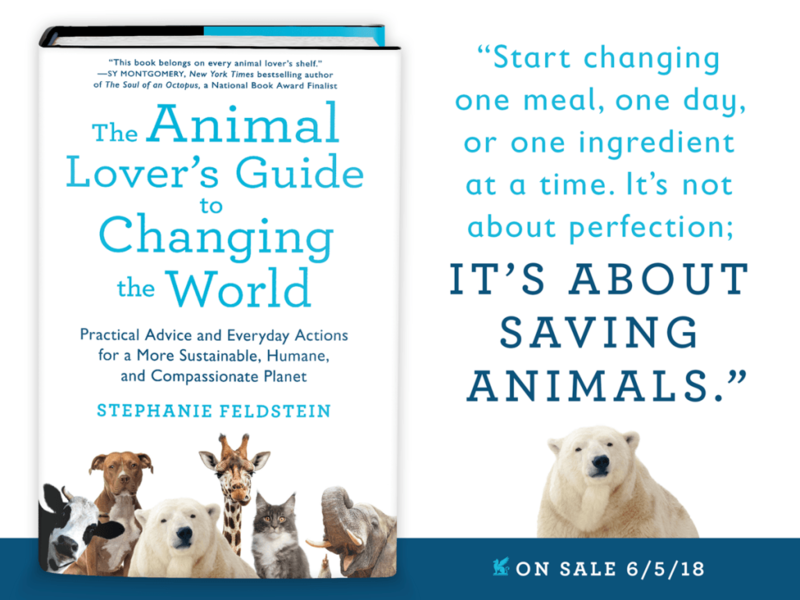 Top Tip - Book Review Animal Lover's Guide to Changing the World > Food! Food choices, however, are very TODAY for me. For a while now, I've been actively eating more plant-based foods and less meat. I'm not militant about it, but I do often eat vegetarian and even vegan meals. I do still eat eggs and sometimes have cow diary products. I love me some cheese, but I make an effort. So if you're looking to do one more good thing for animals -- and yourself -- look at your diet, including if / how grass-fed or free-range animal husbandry affect the lives of livestock. 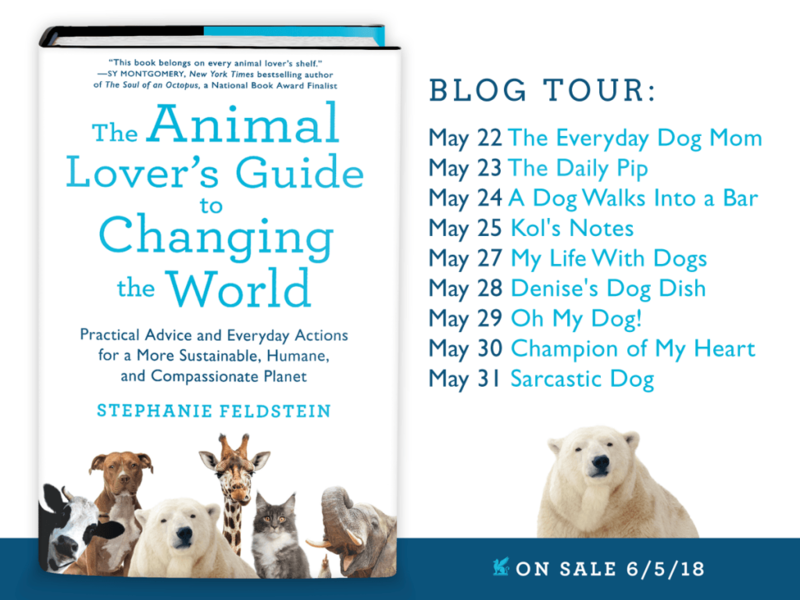 I like that the Animal Lover's Guide to Changing the World covers all areas of modern life where we can make changes that help animals. I like that Feldstein offers real-world strategies for being a better animal advocate through "Action ALERTS" at the end of each chapter. And, finally, I like that you do NOT have to read it cover to cover to engage with the content. You can jump into whatever section interests you the most -- pets, wildlife, farm animals, etc. You don't have to take my word for it, though. You can see what others taking part in the blog book tour found useful in their own lives. As a thanks for this book review, the publisher will send 1 person (in the United States) a free copy of the book. My selection process of the "winner" is going to be subjective. Post a comment with your favorite vegetarian or vegan recipe by midnight (MDT) Sunday, June 3, 2018, and the one that looks the most interesting to me wins. I'll contact the winner privately by email -- so be sure to enter a valid email address when you post your comment. That way I can get your mailing address to give to the publisher. That’s about the longest book title and subtitle I’ve seen, but it certainly looks interesting. If only I wasn’t outside the US I could enter. I’ll have a look and see if it’s available on Kindle. Spread mustard on pocket breads. Cut each pocket bread into 6 triangles; place on ungreased cookie sheet. Cut each cheese slice diagonally into 4 triangles; place 1 cheese triangle on each bread triangle. Arrange mushroom slices over cheese. Sprinkle with Italian seasoning. Broil 4 to 6 inches from heat for 2 to 4 minutes or until cheese is melted. Serve warm. Put arugula in a large salad bowl. Drizzle in 2 tablespoons olive oil and lemon juice. Toss to coat. Season to taste with S/P. Divide among four plates. Heat the other 2 tablespoons of olive oil in a large skillet over medium heat. Add the mushrooms and cook until golden ( about 4 minutes). Add the garlic and thyme, stir,and continue to cook until the mushrooms are tender (about another 4 minutes). Stir in the vinegar and let cook until the vinegar is mostly absorbed. Season with more S/P if needed. Spoon the mushroom mixture over the arugula. Top with shaved parmesan and serve immediately.